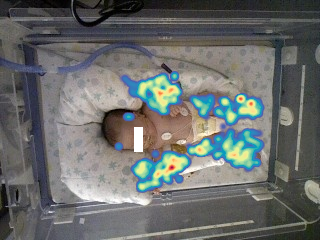 The MIA dataset consists in the states vector, along with the corresponding timestamp, derived from depth measurements collected by an RGB-D sensor placed perpendicularly above an infant, lying in a supine position on the crib, at a distance of 70 cm normally directed to the subject. The preterm infant under examination is a male hospitalized in the NICU of the Women's and Children's Hospital ''G.Salesi" of Ancona (Italy) of 37+1 weeks of gestational age, with a gestational age at birth of 31+2 weeks and a weight of 2050 g.
For data collection we chose the time interval between one meal and the following. During this period, of about 4 hours, the infant can be awake or asleep. We divided this time interval in recording sessions of 300 seconds each one, which allowed us to discard those records in which there is an interaction with a nurse or a clinician. As a result MIA dataset contains a timeline of 16 different states in which the infant under examination was in, for a total period of 35 recording sessions.